WiFi-Liberator ToolKit – 2007 | JONAH BRUCKER-COHEN, PH.D. WiFi-Liberator ToolKit – 2007 – JONAH BRUCKER-COHEN, PH.D.
A Tactical Toolkit to Liberate Pay-Per Use Wireless Networks! Wifi Liberator is an open-source toolkit for a laptop computer that enables its user to “liberate” pay-per-use wireless networks and create a free, open node that anyone can connect to for Internet access. The project is presented as a challenge to existing corporate or “locked” private wireless nodes to encourage the proliferation of free networks and connectivity across the planet. The project was inspired by the ongoing “battle” between providers broadcasting wireless signals in public spaces, in particular: corporate entities, wireless community groups, individual users, and proponents of open networks. Like my Wifi-Hog project, the Wifi-Liberator critically examines the tensions between providers trying to profit from the increasingly minimal costs associated with setting up a public network and casual users who simply want to see the Internet transform into another “public utility” and become as ubiquitous and free as the air we breath. The project targets pay-per-use wireless networks as often found in airports, other public terminals, hotels, global-chain coffee shops, and other public waiting points. Includes PingTunnel by Daniel Stoedle, OSX GUI port by Peter Brindisi. Arte.Mov, November 21-25, 2008, Belo Horizonte, Brazil. Internationale Kulturtage der Stadt, Dortmund, Germany – May 10-29, 2008. FREE Internet access at ANY Internet Cafe, Digg, 2/2/07. WiFi Liberator Unchains the Masses from Paid WiFi, Crunch Gear, 2/5/07. The ultimate goal with the Wifi Liberator project is through Open Source distribution, to eventually reach a high enough usage and penetration rate that all pay-per-use wireless networks will begin to free their access to everyone. Since the monetary amounts associated with providing wireless access is inexpensive as the techology becomes more ubiquitous, the need to “charge” for this access is becoming less important and cost effective. Although we are still charged for basic utilities such as water, electricity, gas, and others, the amounts associated with providing internet access are dropping at an exponential rate. This project aims to make this low cost apparent as well as the increasing tensions of keeping people “out” of these networks. Despite the advent of free and open wireless networks made available by community groups in parks and other urban centers, there is still a monetary restriction on many networks that exist in community buildings and facilities such as airports, train stations, chain restaurants, and other public areas. Most of these “closed” networks are deployed in “waiting” areas with the promise of “convenience” to allow pedestrians or commuters access to the Internet, however they nevertheless impose a monetary and time-based restriction on who can connect as well as for how long, often with “hourly” or “daily” rates for connectivity. Wifi-Liberator is a reaction against these limits to access by lifting the constrictions associated with paid networks and turning them into “free” networks. The project finds inspiration from the Open Source movement’s ability to turn once “commercial” software into freely available and distributable entities. This is evident in examples such as Netscape’s eventual movement into the freely available, and open source distribution model with Mozilla and its successor, Firefox. By taking an existing pay-per-use commercial model into the public domain, the potential for creative use and output from these systems increases exponentially. This is the hope of “Wifi-Liberator”, that once the restrictions are lifted on wireless access points that it will stimulate creativity and social action amongst the general public and those in dense urban locations where many networks currently overlap. The project includes a hardware and software component. The hardware component is an off the shelf, USB wireless card and any laptop with built in wireless hardware. Therefore the “Liberator’s”‘ machine must have 2 wireless interfaces. The software component is a downloadable application called “Liberator” that runs natively on Mac OSX (Windows version coming soon) that needs to be run when connecting to a paid network. The software is based on “Ping Tunnel“, free software written by Daniel Stodle and licensed under the BSD license. 2. Apple Mac OSX machine connected to the Internet with a public IP address. 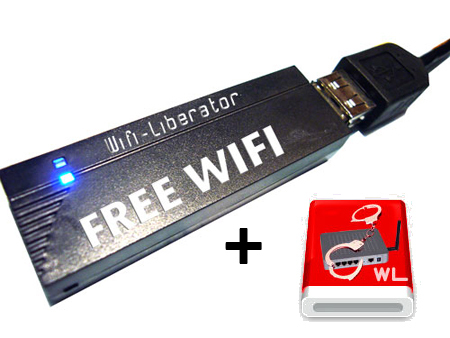 The Wifi-Liberator Software can run in 2 modes – Proxy and Client. 3. Leave this running. You will also need to run a Proxy on this machine such as Squid. 2. Copy the Liberator software to your Applications folder fromt he Disk Image. Double click to start. 3. Enter the address of the Proxy computer for the Proxy address. 4. Enter ‘www.someURL.com’ for the destination address. 5. Enter ‘1234’ for the listen port. 6. Enter ’80’ for the destination port. 8. Run the Liberator software and connect to the closed network through the USB stick. 13. Make sure “Enable Encryption” is not checked – click “OK”. This will allow you to share your Internet connection to other machines when they connect to the “Wifi-Liberator” node. 15. Open a web browser, and enter ‘localhost:1234‘ as the URL. If everything is working, you will have navigated to your URL through the Wifi-Liberator. 16. You’re done! Congratulations and keep sharing your connection until you have to go. 1. Closed Node Use: Users who have existing accounts or pay-per-use accounts can access the network. This typically puts a time limit on their use, prompting them for more money or access codes to continue using the network. Those without accounts or enough money to pay for access cannot connect to the node. 2. Wifi Liberator Node Use: The Liberator connects to the network using the software and broadcasts this connection on a second wireless interface from their computer with the SSID “Wifi Liberator”. Users can then connect to the liberated node as they would any other, “free”, hotspot.